Call it the seven-year itch. 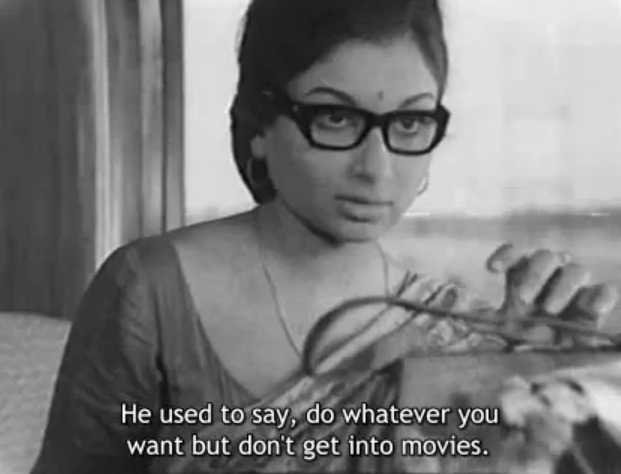 A few weeks ago, I reached the point in my Indian film-watching journey when I suddenly needed to see the Apu Trilogy right now. So I did, and Apur Sansar floored me (even if the rest of the film were dull, the ten minutes or so surrounding the wedding were so thrilling, so moving, that the entire thing could rest on them alone), so thus I have continued. My Bengali Cinema Advisory Team is really knocking it out of the park with recommendations. who surreptitiously takes notes on their conversation. With most of the other passengers on the train, he has mostly brief but endearingly normal interactions. They may seek an autograph or an industry connection, but none of them is obnoxious to him, unlike the people outside this journey, who seem frenzied by comparison. It is these other people on the train, their lives, their problems, that really make this film so special. They give context to the life of the hero, both as contrast, which I expected, and as similarity and familial-ness, which I did not. Everyone shares their cabin or row of seats; everyone has to squeeze past each other in the hallway; everyone has their troubles. The mother with a sick daughter, the holy man, the journalist's jolly friends: they're all on this ride, this life, together. It's as though the hero is the most extraordinary of them only because his is the story we learn the most of. For example, there's clearly something fishy about the advertiser and the businessman he preys upon, but we never learn what. * Following the hero gives us a way in to their stories too; we probably wouldn't otherwise be with these ordinary people on their train ride to Delhi, but they are interesting absolutely in their own right, not as reflected light of the hero. There's a powerful scene in which the train pulls into a station for a short stop, and the journalist tries to shut the blind over wild fans on the platform. The hero insists on the window being unobstructed. She seems so uncomfortable having witnesses to the false pretext under which she is sitting at a table with the hero, to the transgression of his trust in her. He, of course, is used to this kind of madness (he sees it on the platform in Calcutta at the beginning of the journey and will face it in Delhi when he disembarks), and he refuses to sever a tie with an aspect of his life that is familiar—and maybe even comfortable in its familiarity—as he sets off on his unfamiliar and painful introspection. Stranger in a Strange Land has written about this scene in relation to her trip to see shooting for My Name Is Khan, and I was tickled at how similar her reaction to her experience seems to my reaction to being in an SRK-fevered crowd in Chicago a few years ago. I'd shut the blind too. but it also has fun with a lovelorn fellow who fills his love letters with quotes from famous poets. Basically, it nips at anyone who takes a shortcut to personal gain. His girlfriend has to endure both his letters and the aforementioned shyster, and she is unimpressed. 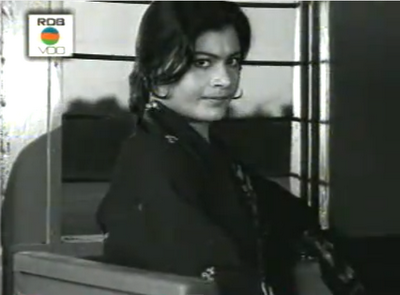 This may be the best facial expression I have ever seen on a young heroine in any Indian movie ever. This is such a light-hearted movie, and you don't mind laughing at everything it gives you because everyone in it is just a little bit ridiculous in their own way, but they're also a little bit relatable. The holy man's assistant (Rabi Ghosh) plays the part of his master's unblinking disciple/servant perfectly, yet he cannot resist breaking character to wink at the ladies listening from just outside the room where the men are fawning all over his master. There's a different group of men, all marked as learned by their stacks of books, laboratory equipment, and chess board, who are determined to expose the holy man as a fraud, but even they are intrigued by the befuddling little gesture he uses to illustrate his theory of the cycles of time. Use your right pointy finger to trace a circle away from you ("the future") while using your left one to trace a circle towards you ("the past"). I have had years and years of piano lessons and do not find this hard at all. I didn't catch whether our skeptics identified as spiritual/faithful/religious in any way, but I have never seen a movie that depicts religion in such an "opiate of the masses" sort of light. In this story, the people who believe are fools, and the people who do the fooling, if they believe in any morals at all, happily put their own pockets first. 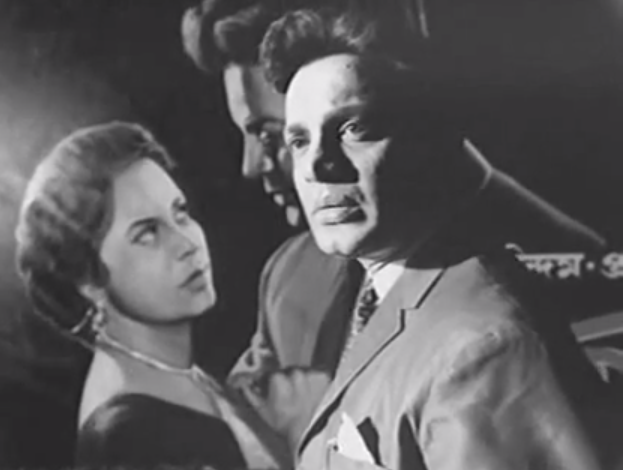 Neither my inner atheist nor the part of me that poo-poos Romantic poetry ever expected to find a soul mate in an Indian film from the 1960s, which probably just shows how much I have to learn about things that aren't mainstream Hindi. Love. * At least those of us dependent on subtitles don't. Beth - I suggest you watch Jalsaghar (The Music Room) next, followed by Kanchenjunga and then Aranyer Din Ratri. Would be loveluy to hear your thoughts on these. I think you should try Pratidwandi (it's probably called The Adversary). 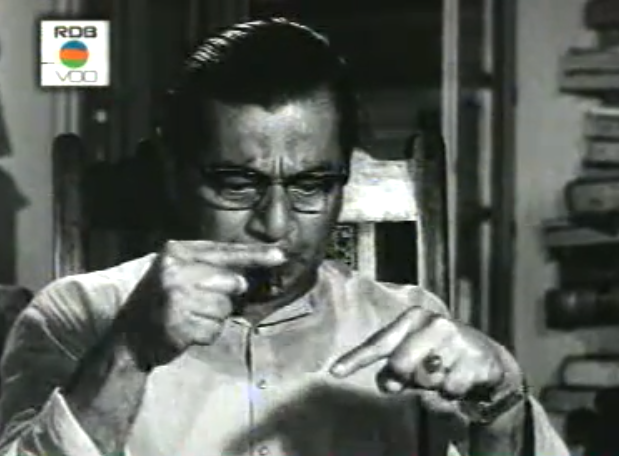 According to a lot of people it's Satyajit Ray's most underrated and one of the best movies. Agree about recommending Kanchenjunga. I loved 'Kanchenjunga' as it is a play for characters on one single day...it is a slice of life film, but everyone changes a bit at the end. I was surprised at myself for loving it as I saw it when i was 15 or so on TV, and I was always shying away from non-mainstream movies (which had no songs and romance). Found Jalsgher a little too heavy and depressing, though I have seen critics say that it is a finely nuanced movie with great music and cinematography. And I saw 'Nayak' around the same time. About the advertiser (was he that?) and the businessman, I think the former wanted a contract or some work, don't remember that bit. But mainly what I remember was that the advertiser was ready to offer his wife to the businessman in the bargain, and the businessman was definitely swayed by it. And it was the same businessman who was actually the father of the sick girl(who was a big fan of the hero) and it was he who vehemently commented about the Hero's character to his wife at the beginning when he found out who their 4th co-passenger would be. I interpreted that as 'though there is a general opinion about loose morals among those in the film industry, it could be anyone anywhere'. Btw, Nayak also has my favorite quote for/against 'multiple births' and I applaud Ray for putting it so subtly (one more point for me being his fan). When the hero's mentor dies, and the hero thinks that he can now join movies without disappointing his mentor, but he is apprehensive about disappointing his mentor's soul, he asks his friend whether he believes in being born again. The friend replies, 'how does it matter? There are very few who miraculously remember their previous births. So, how will I know in my next birth that I am me? Wouldn't that be a new birth for me anyways?" Also, I think the interpretation of the scene at the train window, when the hero shares breakfast with the journalist, is this - He was getting a little apprehensive as his last film or films had not done as well, and in a way that was why he felt insecured enough to ask to speak to the journalist when he was slightly drunk at night. So,for him, to see the adulation was like opium that gave him hope. Whew, you can see that I really loved the movie, because this is what i remember from almost 2 decades back. I think I also loved it because it takes place in a long train journey, which for me has always had potential for romance and characer interplay. Thanks to my public library, I've become a huge of Bollywood/Indian Cinema. I recently discovered the beautiful offerings of Satyajit Ray. Just wanted to say thanks for your informative site. Abhishek - Ooh cool! I'll look for it. I have already reached the end of the Ray selection at one of my two local video places, but I'll keep trying. Plus: NETFLIX! Aparna - That's interesting about Jalsaghar - I did not find it nuanced AT ALL and in fact thought the overt and heavy symbolism killed it. Just posted a short review. re: Nayak: I agree, there was some seriously skeezy stuff going on there, and his hypocrisy was both hilarious and sad. Agree about the window scene, too, but I think there's so much going on there that we can pick up many different thoughts and feelings and reactions for each of the characters. Dee - HOORAY FOR LIBRARIES ALWAYS! :) Do you speak Bengali and thus don't need the subtitles? Or are you reading them but finding them problematic in other ways? Believe me, I need the subtitles!! My biggest gripes are: (1) poor synching of the dialogue with the text or (2) illegible text color. Next up: Devi (The Goddess). Ohhh I'd like to see Devi. My boss is a huuuuuge cinema fan and raves about that one all the time. 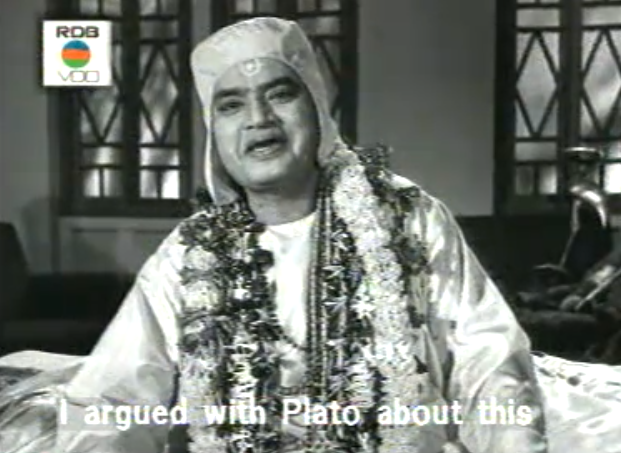 Re: illegible subtitle colors: the Criterion blu-ray of Jalsaghar has that problem, and I was surprised that such a nicely-done project missed such a simple point as that. "... but I have never seen a movie that depicts religion in such an "opiate of the masses" sort of light. " "Neither my inner atheist nor the part of me that poo-poos Romantic poetry ever expected to find a soul mate in an Indian film from the 1960s"
and it also has some information about the author. But in case you have not, please take a look. 2. The author was a remarkable and progressive man. That provides the background for the author's view of people indulging in these 'religious' activities. 3. I put 'religious' in quotes because I don't think the author is attacking religion or theist beliefs. Yet, I use the word loosely for want of a better description ... faux-religious maybe? It is rather a statement on how unscrupulous people like the Babas take advantage of unscrupulous and stupid people who believe. Finally. That circle in opposite directions thing never impressed me. While growing up, I only got to see some of these movies when the TV channel showed them, but would have heard of references to scenes like this for a long time before that. I always maintained that to come across as great, one needs to do more ... maybe sing a song keeping tune while other songs play on. That would be impressive, moving fingers naah.